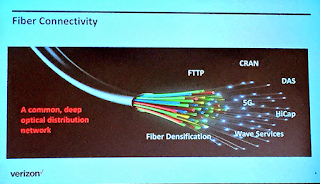 We are big believers in taking fiber all the way to the customer, said Lee Hicks, Verizon, speaking at ADTRAN's Broadband Business Solutions event in Huntsville, Alabama. 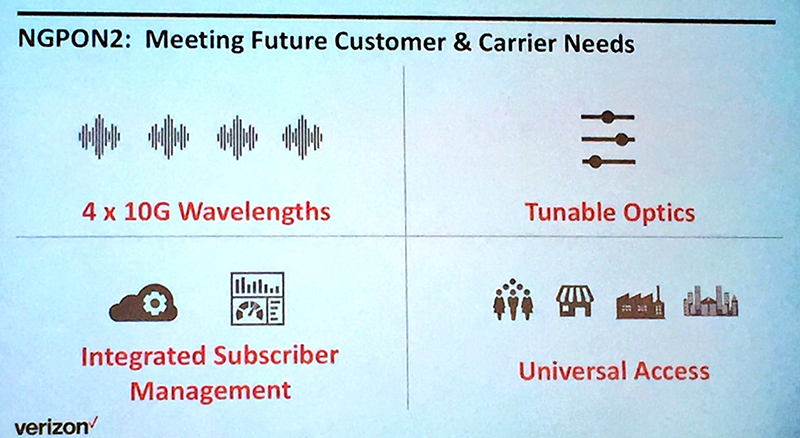 Verizon's One Fiber program is its multiyear strategy to build a common fiber plant for all services, including consumer, business and mobile backhaul. The carrier starts with a deep base fiber, having invested in its FiOS FTTH network for years. In April 2017, Verizon awarded a contract with Corning to purchase up to 20 million km (12.4 million miles) of optical fiber each year from 2018 through to 2020, with a minimum purchase commitment of $1.05 billion. At the time, Verizon cited an initial deployment of its One Fiber approach in Boston, where it plans to invest $300 million over six years to deploy it throughout the city. 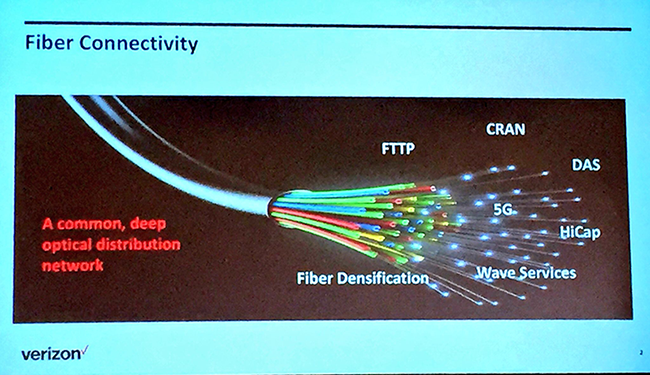 Hicks said NG-PON2 is the right platform going forward for all services, in part because of its ability to support 4 x 10G wavelengths. NG-PON2 is described as a fraternal twin of XGS-PON because it uses the same electronics but more advanced tunable optics. Hicks said Verizon is seeing good results in a field trial of NG-PON2 in Tampa, Florida. There is a somewhat difficult upgrade path from Verizon's installed base of GPON consumer connections, but NG-PON2 could be deployed as an overlay in installed areas. Hicks said NG-PON2's tunable technology and link budget physics have been solved. Vendors need to address the engineering challenge of making NG-PON2 cost effective. ADTRAN is pursuing this opportunity. 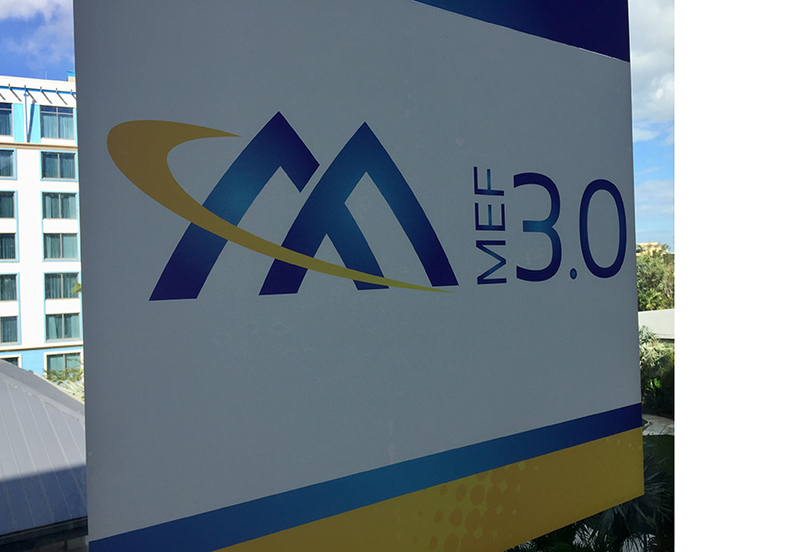 The next step will be vendor qualification tests. 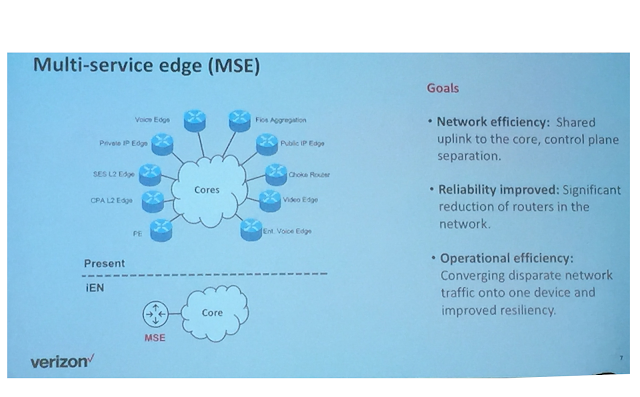 Verizon will leverage this physical plant upgrade cycle to simplify its aggregation architecture. Circuit emulation will be used to convert legacy services to Ethernet. The carrier forecasts a 90% reduction in its router footprint. 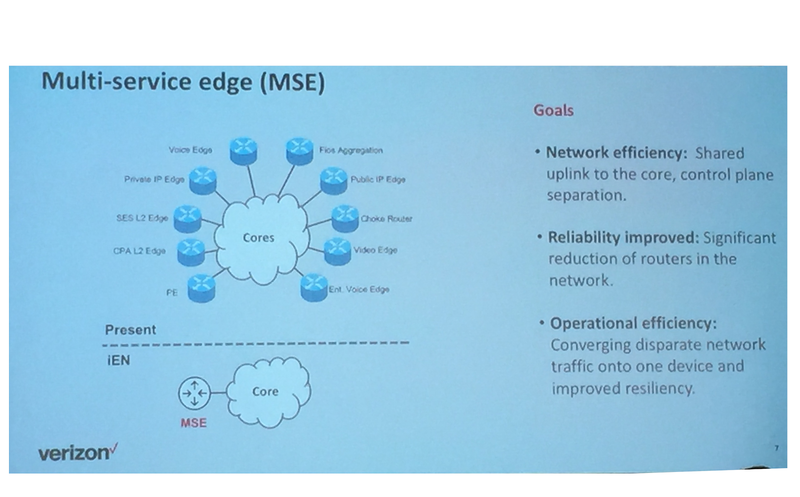 The new Multiservice edge (MSE) promises a significantly lower cost per transported bit. 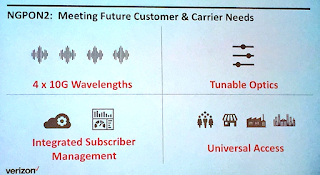 Verizon will also eliminate the many probes it currently uses for service assurance. 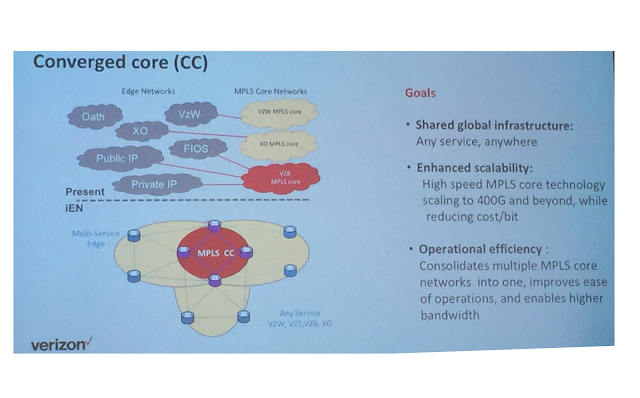 All elements of the new network will collect streaming telemetry data natively and store it in a common data lake. Hicks noted that when Verizon first proposed its new architecture, there were plenty of skeptics inside the company. Now the question has become "why can't you go faster in implementing the changes?" Amazon Web Services announced commercial availability of T3 instances, the next generation of burstable general-purpose instances for Amazon Elastic Compute Cloud (Amazon EC2), providing up to 30% improved price performance than previous generation T2 instances. The new T3 instances are designed for applications with variable CPU usage that experience occasional spikes in demand – such as microservices, low-latency interactive applications, small and medium databases, virtual desktops, development environments, code repositories, and business critical applications. T3 instances feature Intel Xeon Scalable processors and support up to 5 Gbps in peak network bandwidth. “Since T2 instances ‘burst’ on the scene in 2014, they’ve been wildly popular as they’ve helped customers optimize the cost and performance for applications that have variable CPU demands,” said Matt Garman, Vice President, Compute Services, AWS. “We think customers are going to be pretty excited by the launch of our third generation burstable instance (T3) as it’s both 30% more cost effective on a price-to-performance basis than the T2 and enables, by default, the unmatched capability of unlimited burst for customers’ applications. 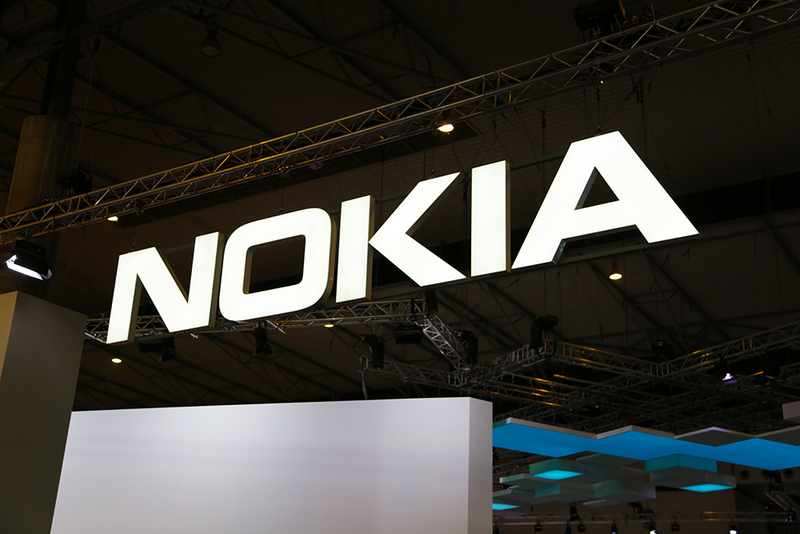 Nokia plans to set a licensing rate of EUR 3 for mobile phones which implement the 5G New Radio standard. Nokia holds a significant portfolio of standard-essential patents (SEPs) for 5G. The company has committed to license on fair, reasonable and non-discriminatory (FRAND) terms, in line with the applicable intellectual property rights policies of relevant standard-setting organizations (SSOs). Beyond mobile phones, Nokia believes that there will be an unprecedented variety of end-user devices that will use its patented 5G technology. The company will determine its licensing rates separately and seeks to engage in constructive dialogue with relevant industry participants to define the licensing models best suited for those industries. Slack, the San Francisco-based start-up offering collaboration apps and services, announced $427 million in a series H funding round. The company has previously raised $827 million in its previous funding rounds. The company says the new level of investment reflects a post-money valuation of more than $7.1 billion. The Series H equity round was led by Dragoneer Investment Group and General Atlantic, joined by funds and accounts advised by T. Rowe Price Associates, Inc. and funds advised by Wellington Management, and Baillie Gifford and Sands Capital, as well as existing investors. Slack Technologies was founded in 2009 in Vancouver, British Columbia, Canada, by a team drawn from the founders of Ludicorp, the company that created Flickr. Pure Storage has acquired StorReduce, a start-up based in Sunnyvale, California that offers a cloud-first software-defined storage solution for managing large scale unstructured data. StorReduce's cloud-optimized technology reduces storage and bandwidth costs, enabling flash plus cloud solutions across a variety of use cases, including data tiering, migration, and protection. Pure Storage said the acquisition adds sophisticated deduplication technology to its object storage portfolio, enabling it to expand its public cloud integrations to meet the growing demand to manage unstructured data in multi-cloud environments. "The StorReduce team has built an incredibly exciting technology that has the opportunity to make a major impact on next-generation storage architectures," said Charles Giancarlo, Pure Storage CEO. "Together, we will help customers execute on data-centric architectures that bridge seamlessly from on-prem to cloud." 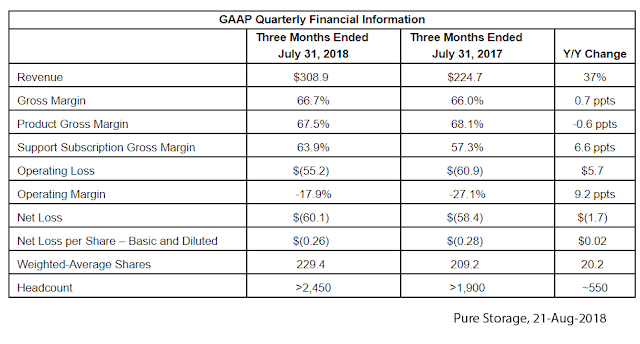 "Pure has delivered another exceptional quarter, with all measures exceeding our Q2 guidance ranges," said Charles Giancarlo, CEO, Pure Storage. 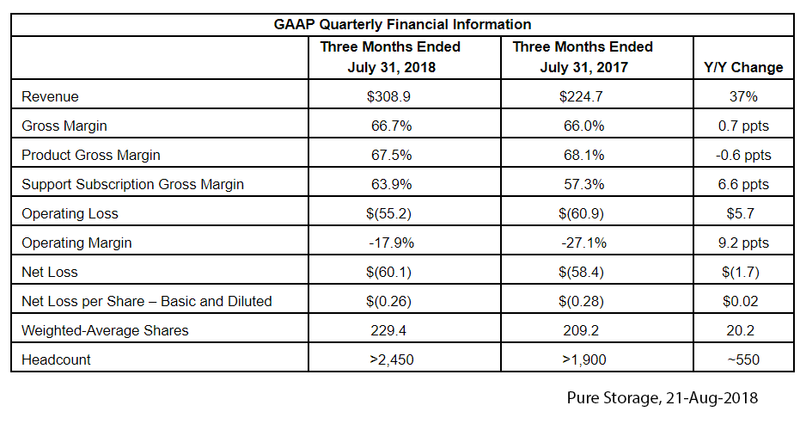 "Our continued focus on enabling customers to succeed in a data-centric world is working and validated, maintaining Pure's lead in the data storage market." The company added nearly 400 new customers in the quarter, increasing the total to more than 5,150 organizations. New customer wins in the quarter include: Dustin Sverige, Honda Federal Credit Union, Fresenius Medical Care, Lufthansa Aero Alzey Gmbh, New York Genome Center, Syntax, TaxSlayer, The University of Texas MD Anderson Cancer Center, and Zeiss Vision Care France. CENX announced a contract to provide its hyper-scale service assurance platform to a globally recognized European Tier 1 operator. CENX's hyper-scale service assurance platform enables closed-loop assurance automation across virtual and hybrid networks. Under the contract, CENX will support the launch of new digital services and business models across fixed, wireless and data center infrastructure. CENX will enable the operator to assure and monitor its physical and cloud network assets within a single-pane while enabling closed-loop automation to better manage increasing complexity. "As carriers increase their network investments to launch next-generation services, the complexity to assure these offerings has skyrocketed. Our vision at CENX is to help communication service providers manage the complexity in their networks by providing a platform, which enables true network automation. Our latest customer win is a reflection of the strength and value of our solution. 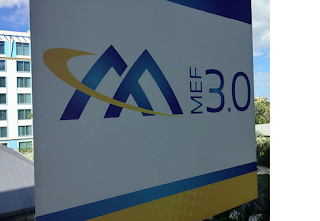 We have raised the bar for Tier 1 service assurance and are excited to deliver automation across this operator's 20+ networks around the globe," stated Jay McMullan, SVP, Sales & Marketing CENX. Twenty-two states are petitioning a U.S. appeals court to reinstate net neutrality rules that were recently overturned by the FCC under Ajit Pai. Additional petitioners include the District of Columbia, Mozilla Corp., Public Knowledge, Open Technology Institute at New America, National Hispanic Media Coalition, NTCH, Benton Foundation, Free Press, Coalition for Internet Openness, Etsy, and INCOMPAS. The FCC voted 3-2 along partisan lines to adopt the "Restoring Internet Freedom Order" proposed by FCC Chairman Ajit Pai to rollback Obama-era Net Neutrality rules. Voting in favor of the order were Republicans Ajit Pai, who argued that measure will usher in a new era of investment for Internet infrastructure. Also voting in favor were Republicans Michael O'Rielly and Brendan Carr. Voting against the measure were Democrats Mignon Clyburn and Jessica Rosenworcel. FCC Chairman said that by returning to the classification of Internet services as an “information service”— removing the current Title II regulatory regime that gives the FCC say over the delivery of Internet content — the new order returns the industry to the status quo prior to 2015. The vote proceeded despite an urgent request from the Attorney Generals of 18 states urging a delay to the vote due to a criminal investigation into possible fraudulent manipulation of the FCC's public comment process for this issue. In a public letterto FCC Commissioners, the Attorney Generals said their ongoing review of the public comments process has revealed a large number of fake comment submissions using the names and identities of real people. The initial assessment is that there were over 1 million fake comments indicating a deliberate effort to skew the public comment process on an issue of national importance. The Attorney Generals are also requesting the help of the FCC in their investigation of "massive identity theft. 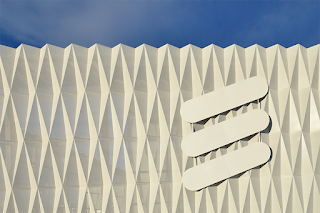 Ericsson won a two-year network managed services contract extension from MBNL, the network-sharing joint venture between UK mobile operators Three and EE. 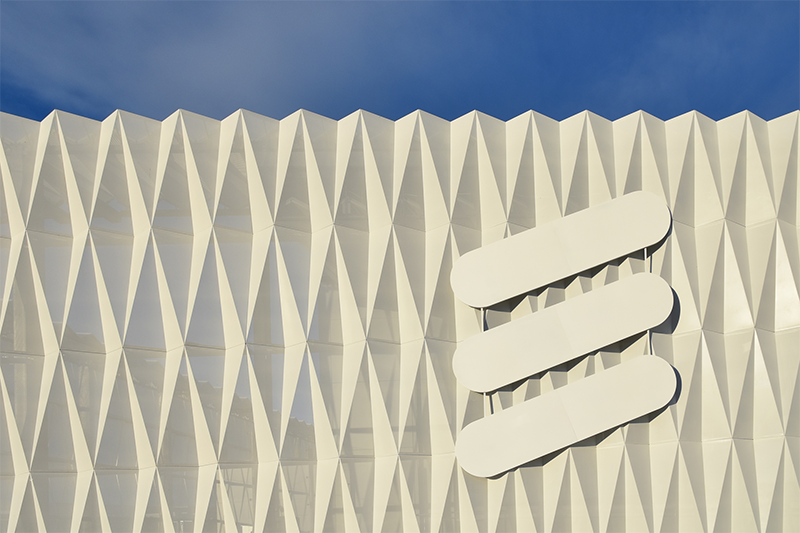 Ericsson has been MBNL’s managed services provider since 2009. The new extension covers Design, Plan and Deploy projects from June 2018 until May 2020.